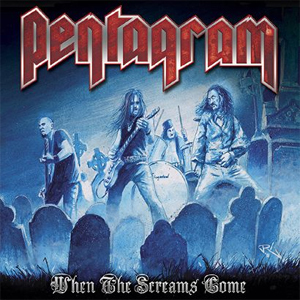 Metal Blade has teamed up with PENTAGRAM to release When The Screams Come on April 17th for the first time ever on vinyl, which was previously only available on DVD. The album features the amazing live show captured during Maryland Deathfest 2010, plus five additional exclusive bonus tracks recorded in 2014. When The Screams Come will be available on gatefold double vinyl in three versions (180g black - clear/blue splatter - red). A free poster comes with all three versions. Peaceville Records recently announced the re-signing of PENTAGRAM for its forthcoming studio album, set to be released summer 2015. The highly influential American heavy metal/doom act, fronted by the mysterious Bobby Liebling, formed in the early 1970s, though its debut album - now known as Relentless - didn't see a release until 1985. Through four decades of adversity and triumph, PENTAGRAM has become a legendary international act and has firmly stamped its name in the heavy metal history books. PENTAGRAM recently completed pre-production with Swedish producer Mattias Nilsson at studios in Baltimore, Md., D.C. and Va., with additional vocal and guitar production in Knoxville, Tenn. with Travis Wyrick. Wyrick is a Grammy Award-winning producer who produced the band's previous album, Last Rites. The band comments on the signing: "PENTAGRAM is happy to return to the label that helped relaunch interest in our debut album and introduce us to a new metal audience in the 1990s. Peaceville Records has been an ally to us throughout the past 20 years. We are happy to have them by our side once again as we record our fourth album under their banner. Never properly recorded songs written by Bobby in the 70s will be heard on the album as fresh as they were when they were written over 40 years ago. Brand new numbers by the core of Griffin, Turley and Liebling that were written this fall will appear along the old songs, and will produce an album that encompasses the true spirit of PENTAGRAM. Doom is often mistaken as exclusively slow music. If you listen to our classic 'doom' album Relentless, many of those doomed classics are quite fast. One of the magics of doom metal is to have a faster song seem much slower because of the sheer heaviness of the number. That's what we are going for. The band will sound like they are as much from the street as they are from the SABBATH, because, well, we are."